OFFICIAL FESTIVAL WEBSITE www.bpf.or.kr ^^Dynamic Korean Street Music Festival up and down four streets in the heart of Incheon: Bupyeong. Amazing variety of acrobatic folk drumming, dancing, singing, farming life, hands-on activities including instruments from around the world, and plenty of street cuisine. 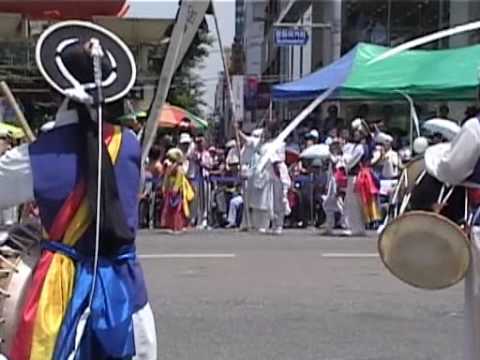 The festival hosts competitions and showcases for students and professional groups of Korean POONGMUL, or NONGAK, popular drum and gong and horn ensembles based on farmers’ musics and planting rites, which are derived from shamanic traditions. THIS VIDEO SHOWS HIGHLIGHTS FROM DAY 2, Sunday Afternoon. COMING SOON: COMING SOON : More highlights from Day 2, including some great acrobatics, an actual farmer’s group performing a seeding and planting ritual (pungmul is said to help the crops grow), a “battle” between a Western University-style marching band and a Korean folk band, as well as people drumming with flaming drums and drumsticks.